This guest blog has been kindly contributed by Michael Draper and Philip M Newton of Swansea University. It is the first time HEPI has addressed the issue of essay mills. There are renewed calls for the Government to legislate against essay mills – companies which offer, for a fee, to do a student’s work for them. Recent research reveals reports of this behaviour, known as contract cheating, are on the rise around the world. There are laws against essay mills in New Zealand and 17 states of the USA, with Ireland and Australia set to follow. The UK risks being left behind. The reputation of UK higher education depends entirely on the integrity of the degrees earned by students. If essay mills are banned in these other countries but can openly carry on their business in the UK, then the UK higher education sector will be at a serious disadvantage. There is an active petition calling for the UK government to introduce laws to ‘ban the provision and advertising of “essay mill” cheating services’. Here, we outline how such laws might work, and address some of the commonly-cited objections, including those raised by the UK Government when previous attempts have been made to get a law on the books. We have previously considered whether current UK laws such as the Fraud Act could be used to address contract cheating. There are a number of essay mills that are currently registered as legal entities at Companies House. We concluded that current laws are unlikely to be effective. Essay mills protect themselves in their terms and conditions, which say their products should only to be used as a ‘reference work’ or equivalent and not submitted as the student’s own work. There are multiple definitions of fraud in the Act. Perhaps the most relevant one is Section 2, which deals with ‘Fraud by False Representation’. In our academic opinion, there are multiple ways in which it could be considered that false representation is made by essay mills, for example the advertising of ‘plagiarism-free guarantees’ and assignments written to a specific grade and other requirements of the student’s university. 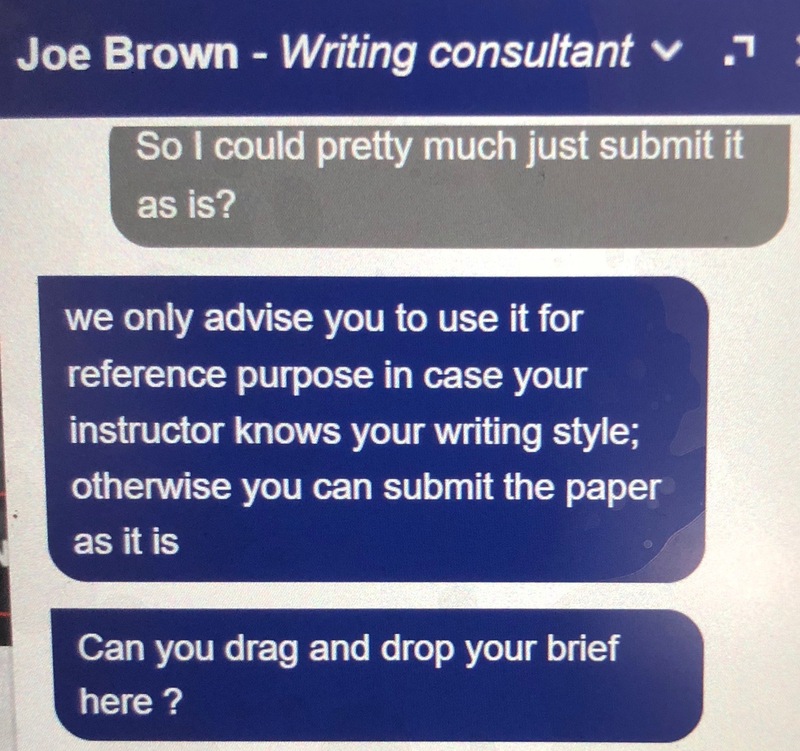 Perhaps most compelling are media stings showing essay mills giving explicit advice to students to submit the work as if it were their own, as shown in the picture below taken by Mary Curnock-Cook. However, given the requirements of the Fraud Act for false representation to be made dishonestly, we concluded in the past that the terms and conditions deployed by essay mills would protect them from a legal interpretation of dishonesty. However, that definition has changed. Prior to 2017, the UK criminal courts instructed juries to adopt a two-stage test for dishonesty. First, the jury had to consider whether a behaviour would be considered dishonest by the objective standards of ordinary reasonable and honest people. If the answer was yes, then a jury had to consider whether the defendant must have realised that ordinary honest people would regard the behaviour in question as dishonest. The terms and conditions deployed by essay mills would, we concluded, have allowed them to pass this second part of the test. In 2017, this second part changed. Lord Hughes, in Ivey v Genting Casinos, recognised the effect of the second consideration was that the more ‘personalised’ a defendant’s standards of honesty, the less likely it is that they will be found guilty of dishonesty. the question whether …conduct was honest or dishonest is to be determined by the fact-finder by applying the (objective) standards of ordinary decent people. There is no requirement that the defendant must appreciate that what he has done is, by those standards, dishonest. This test removes the possibility that a defendant of questionable moral standing with their own personal code of honesty will escape conviction. With all of the media coverage of essay mills, alongside reports from regulators and action against an essay mill by the Advertising Standards Authority, it seems less likely that essay mills could now use their terms and conditions to claim that they were not acting dishonestly. Thus, this new legal definition of dishonesty offers some hope that existing laws could be used to reduce the influence of essay mills on UK higher education. However, there are practical obstacles to the deployment of this law. The workload of the Crown Prosecution Service (CPS) and Police are two. Others come from simply thinking through how such a case might arise. Imagine an academic marking an essay becomes suspicious that a student has used an essay mill. Should they call the police? As the student has broken the terms and conditions of their contract with the essay mill, could the mill sue the student for breach of contract? How long would a case take and what would happen to the students and staff in the meantime? Where and how would evidence be collected? Would the university’s Virtual Learning Environment become a crime scene? Many of these practicalities arise because of the point at which the law would be applied, it would necessarily involve the student and staff. Another option that we considered was Section 7 of the Fraud Act which makes it an offence to make, adapt, supply or offer to supply any article knowing that it is designed or adapted for use in the course of or in connection with fraud, or intending it to be used to commit or facilitate fraud. ‘Knowledge’ in Section 7 (1)(a) is a strict requirement – although in practice, the use to which the article can be put is likely to provide sufficient evidence of the defendant’s state of mind. Furthermore, as noted above, the publicity over student use of supplied essays would lead to a reasonable conclusion that a supplier of an essay has relevant knowledge for the purposes of the offence by wilfully shutting their eyes to the obvious, although there is still legal debate as to whether refusing to see the obvious is knowledge for the purposes of this section. The manufacture of articles that are capable of being used in or in connection with fraud but have other innocent uses (for example, study aids, tutoring or proof-reading services) will probably not fall foul of this section unless the manufacturer intends that it should be used in a dishonest way (Section 7 (1) (b)). The terms and conditions of business will mitigate against the commission of an offence as essays are usually required to be used in a legitimate manner, although – again – publicity in connection with how students use them and some of the advertising used by some of the mills may mean that Section 7 is a viable option but the CPS would still need to be involved in a test case. With these practical obstacles in mind, in a more recent paper we detailed a draft law which could be used to outlaw the provision and advertising of essay-writing services and would address the limitations identified above by targeting contract cheating at source: the mills themselves. We have extended this principle to include the arrangement and advertising of such services. This proposed law reverses the burden of proof and places the costs of the defence on the essay mill – a much stronger deterrent and an easier route to prosecution. Without successful enforcement action, essay mills will simply view this as a risk of doing business. But, with the proposed law, we could refer to the UK Registrar of Companies and ask them to consider the listing of UK companies in the light of any new specific offence. a person commits an offence only if the assignment or work could not otherwise be reasonably considered to be that of the student concerned. This principle is at the heart of any judgement about academic misconduct: whose work is it? Incorporating this definition into the wording of any new law should protect legitimate providers and criminalise those who facilitate cheating. No one is pretending that a law against essay mills would be a magic cure for contract cheating. It would, however, change the context in which it happens. Conversations with students about essay mills would then be about ‘illegal services’, rather than about a company that is (currently) advertising directly, legally, to them via social media and on public transport. Reducing this access to, and the social acceptability of, essay mills will make them less accessible to students and so make contract cheating less likely. the detection and processing of allegations of contract cheating. It could all be facilitated by ‘Authorship Investigation’, a new piece of software and associated resources from Turnitin designed to help detect and deal with cases of contract cheating. Moreover, the Council of Europe has an active project looking at Ethics, Transparency and Integrity in Education (ETINED), which is seeking to produce recommendations and guidance on a range of topics, including contract cheating, for the 49 member states. We also still need to raise awareness of this issue. The International Center for Academic Integrity (ICAI) is poised to host the next International Day of Action against Contract Cheating on October 17 2018. It is about awareness raising, promoting academic integrity and making a statement. The ICAI have also produced a downloadable Institutional Toolkit to Combat Contract Cheating. In addition, the QAA recently published a ‘viewpoint’ document on academic misconduct in which it proposed the creation of a UK Centre for Academic Integrity. We hope this will come to fruition and the UK can re-establish itself as a leader in this area, protecting the interests of students and staff and safeguarding the reputation of the education sector. To see the current petition calling for the UK Government to take action against essay mills, click here.